This popular bird is admired for its great agility in flight. It is small and has a slender body with long, narrow, pointed wings, and a long and deeply-forked tail. 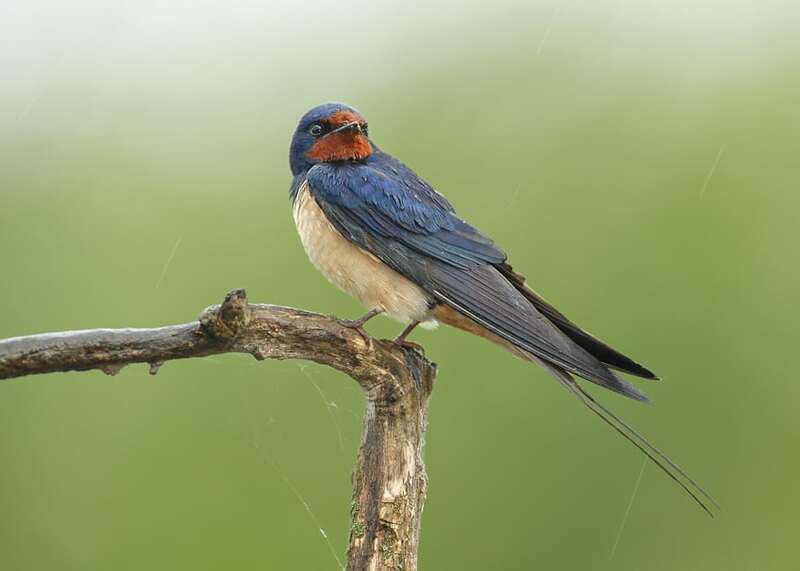 The Barn Swallow has an attractive plumage: metallic blue-black above and pale beige below, red on the throat and forehead, and a black collar. The wings and tail are also black. Males and females are very similar in appearance, although females tend to be less vibrantly coloured and have shorter tail-streamers. The young have paler underparts and a less deeply forked tail. 10% of the sale price of this neckwarmer is donated to the environmental NGO SEO BirdLife. For further information about the work carried out by SEO BirdLife, take a look to this page. The European population is estimated to be between 29 and 49 millions pairs, which equates to 58-97 million adult individuals. Since Europe hosts approximately 20% of the whole population, a very rough estimate of global population size would be 290 to 490 million adults. Hirundo rustica breeds throughout the Northern Hemisphere (most of North America, Europe, and Asia) and winters across a large area of the Southern Hemisphere. Before the onset of cold weather, it travels southwards to Africa, Central and South America, South Asia, Australia, and Micronesia to overwinter. 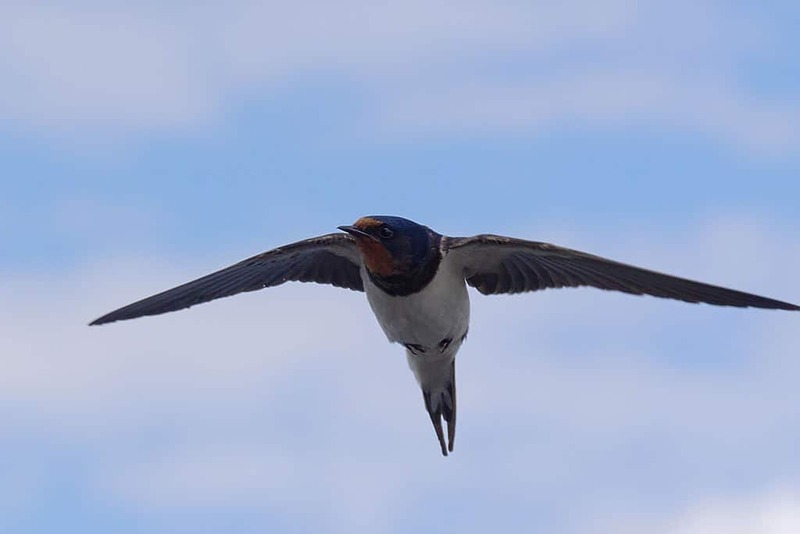 The Barn Swallow is a very adaptable bird and can nest anywhere as long as open areas for foraging, a water source, and a sheltered ledge are available. Traditionally, nests were built in caves. Today, due to man-made artificial structures, they can be found in a great variety of habitats. In Europe and North America Hirundo rustica is primarily a rural species, as it prefers to breed in farm buildings. However, in North Africa and Asia it often breeds in busy towns and cities. 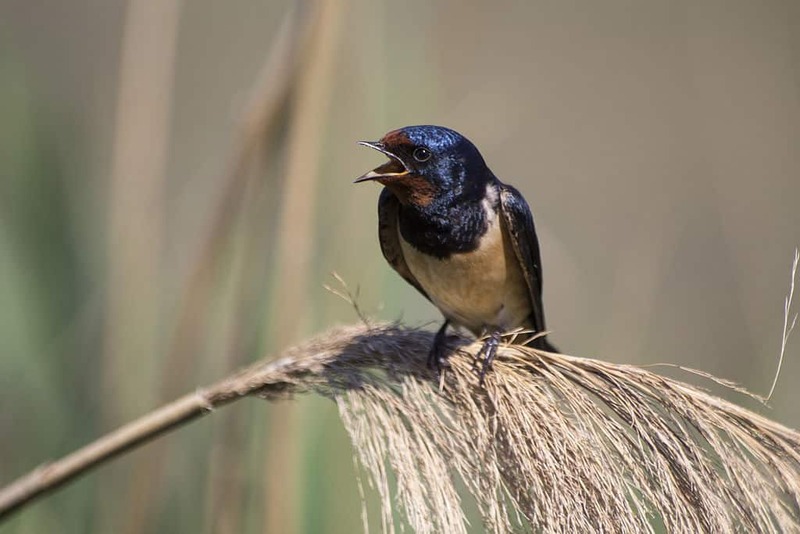 Barn Swallows usually breed between May and August, but this varies greatly according to location. At the beginning of the breeding season, males try to attract females by spreading their tails and by singing while circling high above the nesting site. Although it is considered a monogamous bird, occasionally males mate with 2 females simultaneously. Females prefer to mate with males that exhibit more symmetric wings and tail, as well as a longer tail. It has been observed that asymmetry can result from genetic factors and from environmental stress, such as food deficiency and parasite infestation. This might explain why asymmetric individuals also show decreased strength and longevity. Therefore, females selecting symmetrical mates would in fact be selecting a superior individual. Couples explore a number of potential nesting spots before choosing. Usually they return to the same breeding place year after year. Both birds cooperate in building the actual nest, first constructing a small mud shelf to sit on, and then building up the sides of the nest. Finally, the nest is lined with grass and feathers. It takes about 10 days to build it. The female usually lays and incubates 4 or 5 eggs, which hatch in 13-16 days. The chicks are bald and helpless when hatching. They remain in the nest 18 to 27 days and are fed and cared constantly by the male and the female. The first few days after leaving the nest, young return to the nest each night. Usually 2 broods of chicks are raised each summer. Hirundo rustica is diurnal. It is often spotted in a large social group sitting on elevated structures. They nest in a colony, probably as a result of the distribution of high quality nesting sites. Within a colony, Barn Swallows defend the territory around their nest. These territories range from 4 to 8 sq. m.
Barn Swallows have a wide variety of calls used in different situations, both individually and in chorus. Barn Swallows are insectivores and catch most of their prey while in flight close to the nest. They eat flies, mosquitos, beetles, wasps, moths, and other flying insects. While foraging, they fly lower than many other birds, almost hugging the ground or the surface of the water. In fact, this species is also able to drink on the wing. Kestrels, hawks, falcons, owls, gulls, grackles, rats, squirrels, weasels, raccoons, bobcats, domestic cats, and snakes are all predators of the Barn Swallow. They often escape predators by being swift and agile in flight and by building their nests in places that are difficult for predators to reach. Maximum lifespan in the wild: Barn Swallows are recorded to live less than 4 years, although one known bird was recorded to be 15 years old. The reduction in insect prey due to the use of herbicides and pesticides, as well as intensive livestock rearing. Loss of habitat: barns and outbuildings, which once housed Barn Swallows, have often given way to more urban settings. Others have been abandoned and are in ruins. 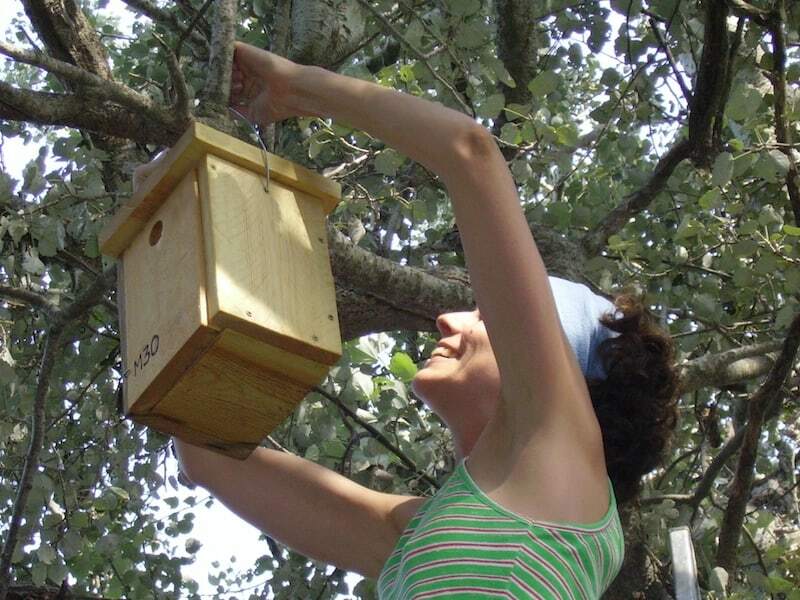 Removal of nests by humans as they are considered a nuisance. 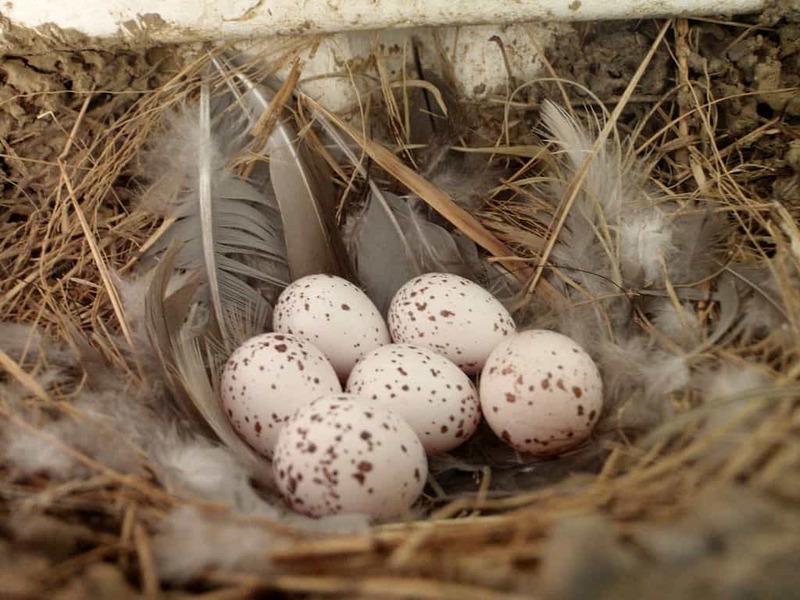 In North America, House Sparrows, where introduced, are serious nesting site competitors. 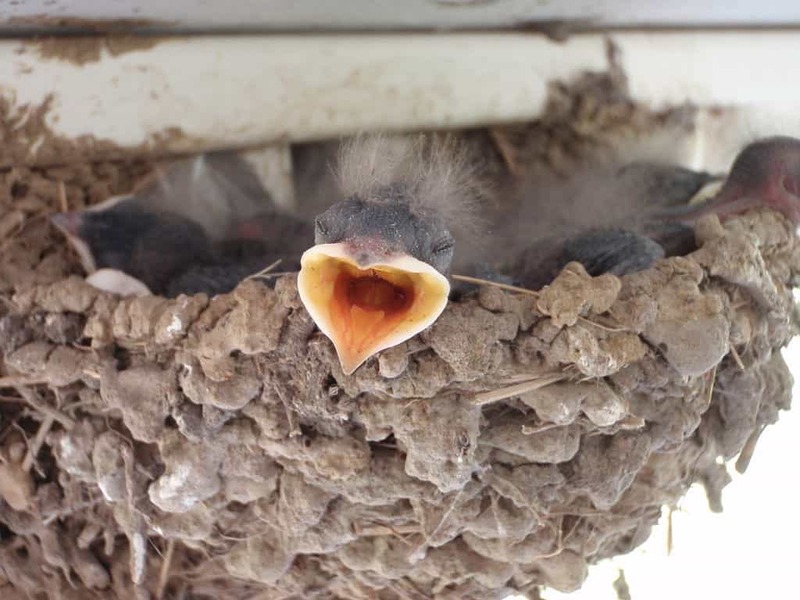 They take over Barn Swallows’ nests and destroy both eggs and nestlings. When re-using nests, Barn Swallows clean out old feathers and add new mud to the nest’s rim. Unmated adults often associate with a breeding pair, helping parents with nest defense, nest building, and incubation. These ‘helpers’ are predominantly males, and may succeed in mating with the resident female, resulting in polygamy. Young from the first brood of the season have been observed assisting their parents in feeding a second brood. Hirundo rustica forages opportunistically, and has even been observed following tractors to catch insects thrown up by the machinery. According to a legend, the Barn Swallow got its forked tail from stealing fire from gods in order to bring it to the people. An angry god hurled a fire brand at the swallow, singeing its middle tail feathers. More than 80 insect families have been recorded as part of the Barn Swallow’s diet.